The next review on Alien Fresh Jerky will focus on a 4 ounce/113.4 gram bag of their peppered flavored beef jerky. 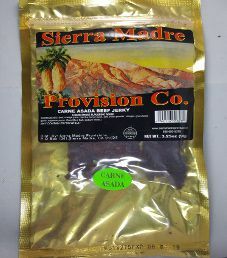 This bag was purchased at the actual Alien Fresh Jerky store located in Baker, California, just off the I-15 interstate. 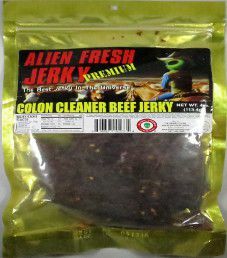 The next review on Alien Fresh Jerky will focus on a 4 ounce/113.4 gram bag of their colon cleaner flavored beef jerky. 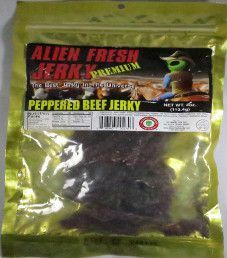 This bag was purchased at the actual Alien Fresh Jerky store located in Baker, California, just off the I-15 interstate. 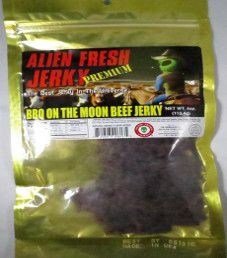 The next review on Alien Fresh Jerky will focus on a 4 ounce/113.4 gram bag of their BBQ on the Moon flavored beef jerky. 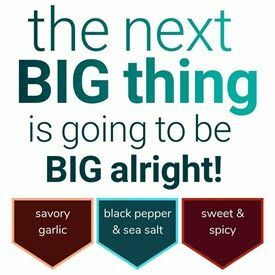 Worth noting is that the actual jerky weight is only 106 grams, where you are shortchanged near 10% of the jerky weight. 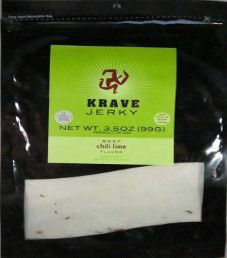 This bag was purchased at the actual Alien Fresh Jerky store located in Baker, California, just off the I-15 interstate.